After the first walk through of the house I knew I wanted to hang out TV above the fireplace. It took a lot of convincing to get Kurt on board. Our mantle is quite large, placing out 32 in flat screen much higher on the wall than is ideal. However, Pinterest saved me yet again and after showing Kurt several pictures I was able to get his buy in. The question was “How! ?” Most of the tutorials about wire hiding did not include a fireplace. This prevented us from simply droping the cord straight down behind the drywall… we were going to have to go through at least two sets of studs to get to our outlet. The thought of drilling through our studs was overwhelming so we were determined to find another way. 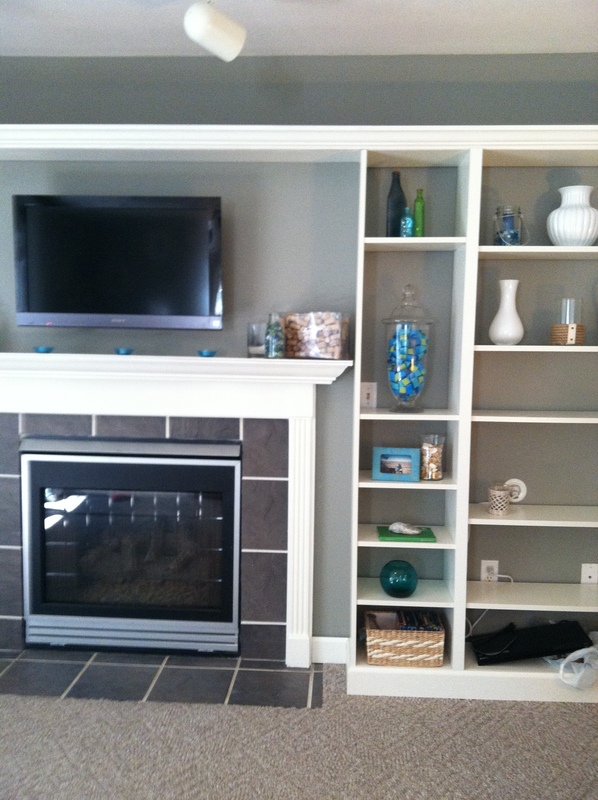 We are absolutely loving our faux Ikea built ins. They add some interesting architecture and a whole lot of character. They also help hide some of our wires! Yeah, that is not cute. Our solution was to take the cords up to the crown molding and run it along the top, bypassing the studs before dropping down to our outlet. Kurt mounted our TV per the instructions and drilled a small hole for our cables to go through. We use an Apple TV instead of traditional cable and have not hooked up our Blu-Ray Player yet so we just had the power cord and an HDMI cable to contend with. We fed the cords through the hole and brought them up to the crown molding and drilled another hole. We made this hole as small as possible to keep it from showing. 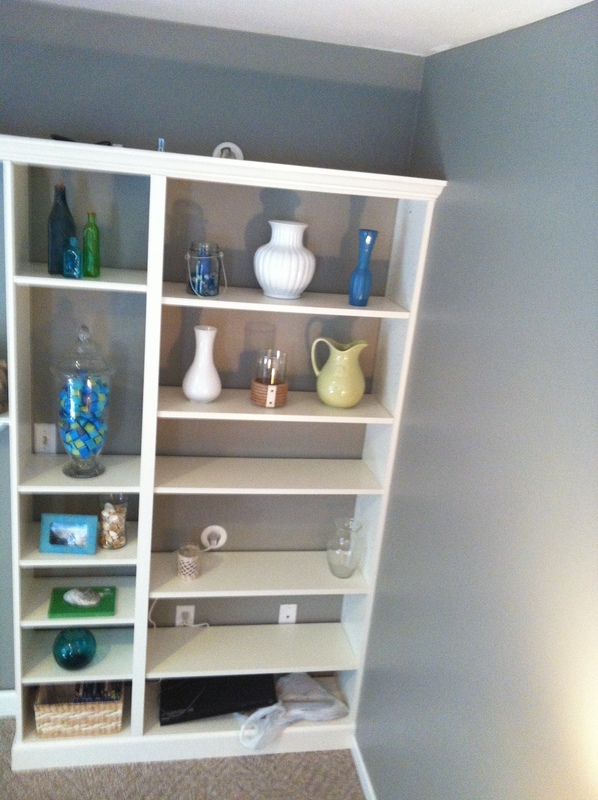 You can kind of see it from the kitchen, but the built ins are so pretty I doubt any one will notice…. except now I just told you. Then we just ran the cords along the wall by the crown until we reached the spot that we wanted to drop down our cords. 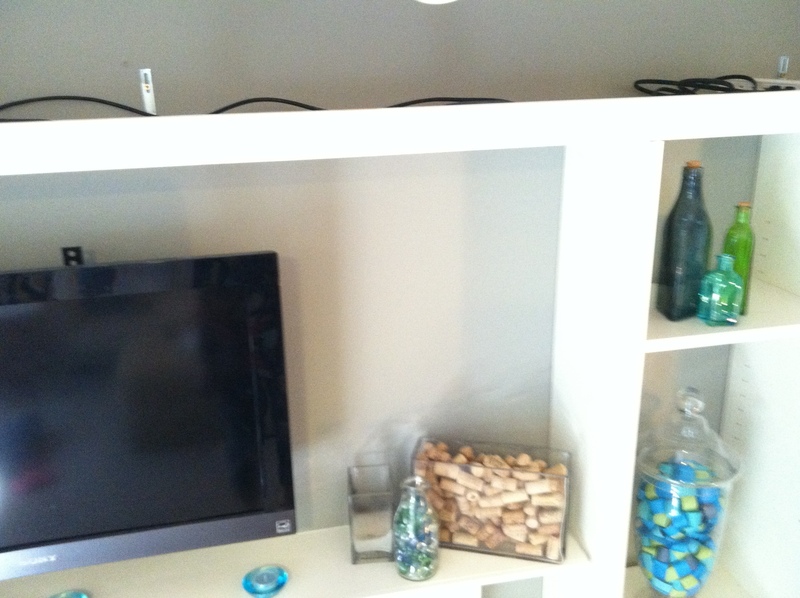 We also used this opportunity to hide our Apple TV and a power strip sitting on top of our bookcase. We use my Iphone and our Ipads as bluetooth remotes so there is no need to be able to see our Apple TV. To drop our cords through the wall we used the “Flat Screen TV Cord & Cable Power Kit” by Legrand which we picked up from Home Depot for under $20. From here on out, we were able to just follow the instructions. 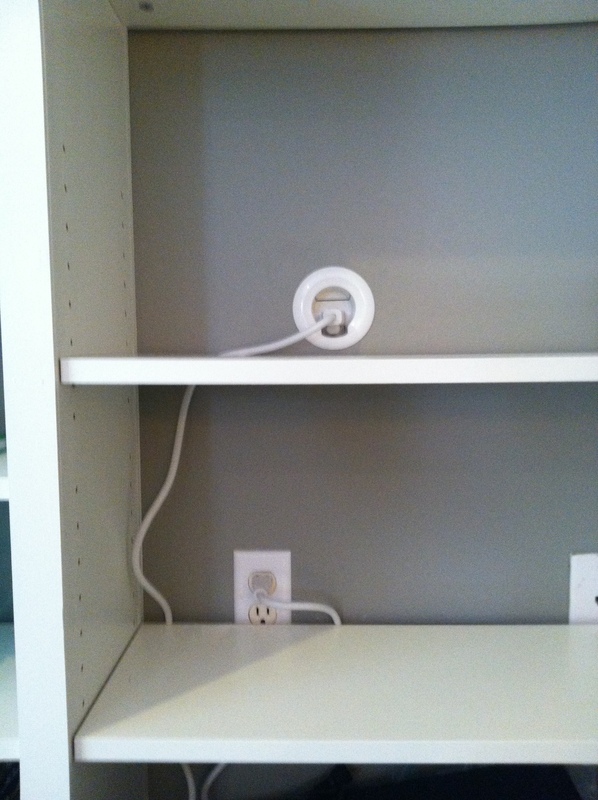 We attached the first power grommet to the wall at the top of the bookcase. The kit came with a really cool hole saw which made this really easy, it just attached right to our drill. We used the included fish tape to feed our cords down to another hole 5ft down. The power harness could only reach five feet so we didn’t quite make it all the way to the outlet, but it is still such a huge improvement! We used the second power grommet to cover this hole and then simply ran the power cord to our outlet. 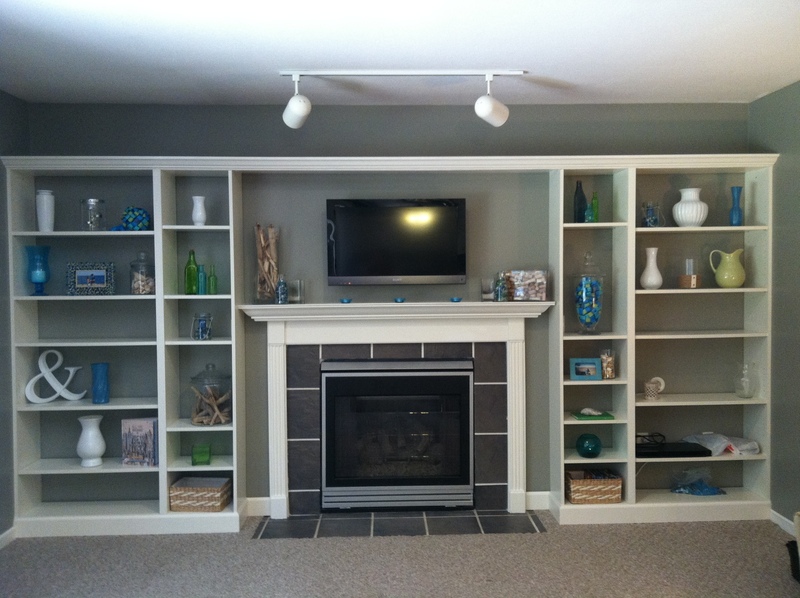 The whole thing was a pretty quick project and it was wonderful to use our bookcases as part of our solution. It is wonderful to have the power strip and our Apple Tv out of sight. 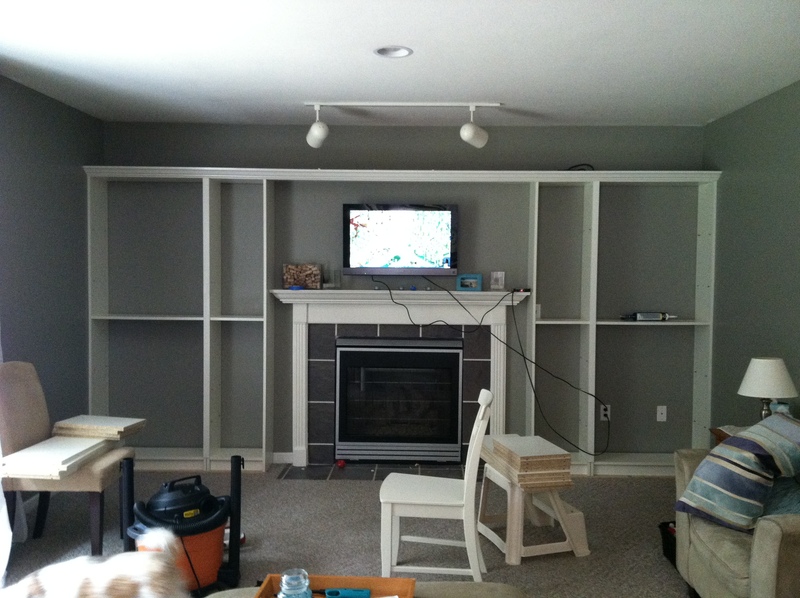 We love the clean look of the mounted TV and hidden cords. Thank you! 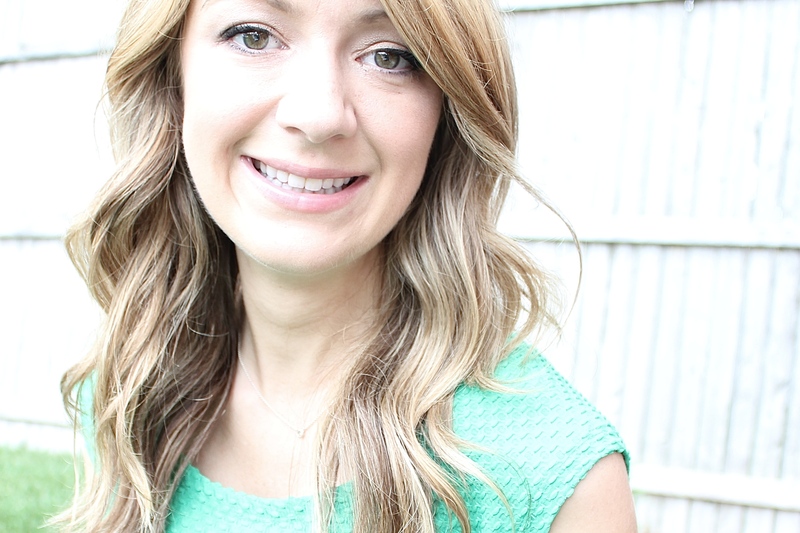 I love a quick and easy project! Thank you so much for stopping by!! Quick and easy project worth sharing. I don’t really understand how you hid the cord from the TV up to the top. Can you explain a little more? 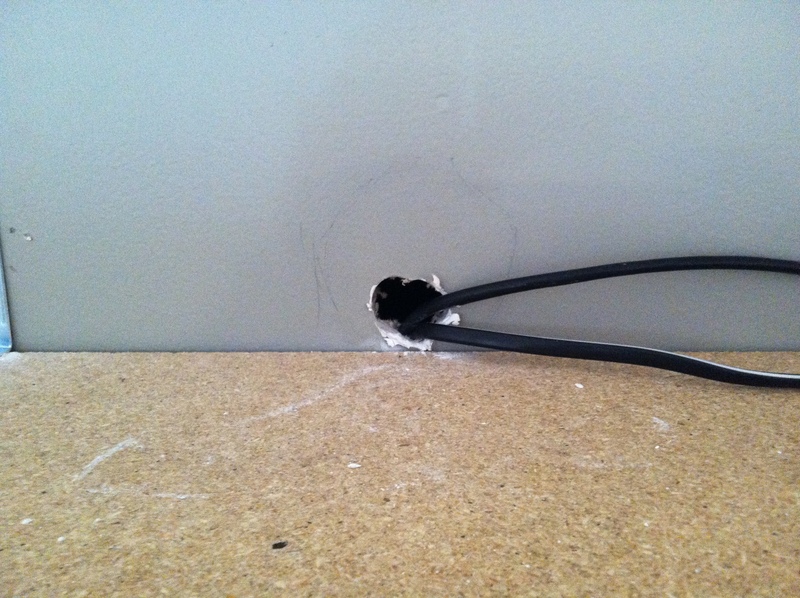 The cord went behind the drywall between the studs through a hole in the wall behind the TV. There was another hole right above it behind the crown molding where it came back out. Then it was snaked along the top of the crown so that we didn’t have to drill through any studs. Where did you hide the cable/ satellite boxes? I don’t have cable tv. The only component that I had was a Blu-Ray player which was kept on the shelf by the outlet. I used a long HDMI cable which ran through the walls to connect them. I imagine that cable or satellite could possibly work the same way?